Detail in carved interior architectural wood. The pattern is made up of steps in increments of about 1/4″ that recede under an overhang. Where the vertical and horizontal step patterns meet, the steps appear to be cubes. Decorative touches on a steel Manichithrathazhu, or മണിച്ചിത്രത്താഴ്, lock in the Kerala Folklore Theatre and Museum, Thevara, Ernakulam. 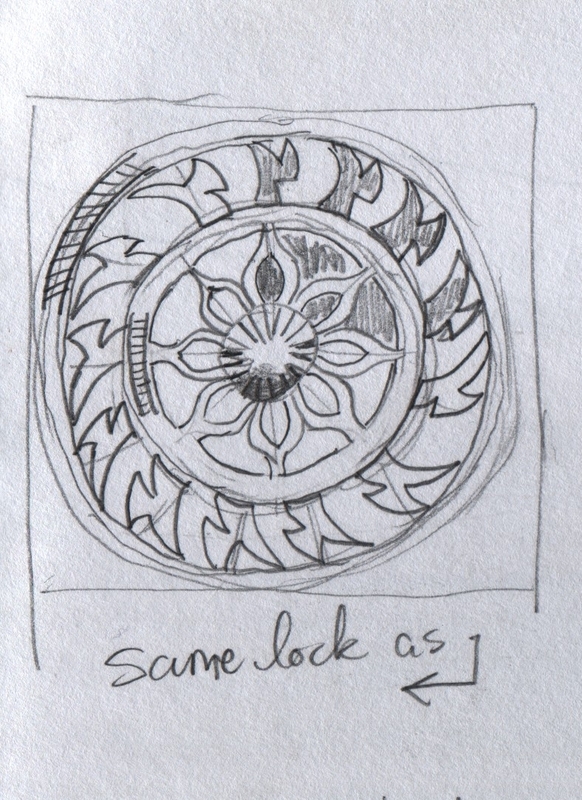 The Manichithrathazhu is a traditional Kerala ornate lock that I sketched elsewhere. The surface hardware on മണിച്ചിത്രത്താഴ് manichithrathazhu, or bell picture locks, can sometimes be ornate. This circular feature, maybe an inch or two across, is intricately pierced. Kerala Folklore Theatre and Museum, Thevara, Ernakulam. I was told that families use this small, hand-held oil lamp during a Hindu sunset ceremony at home. 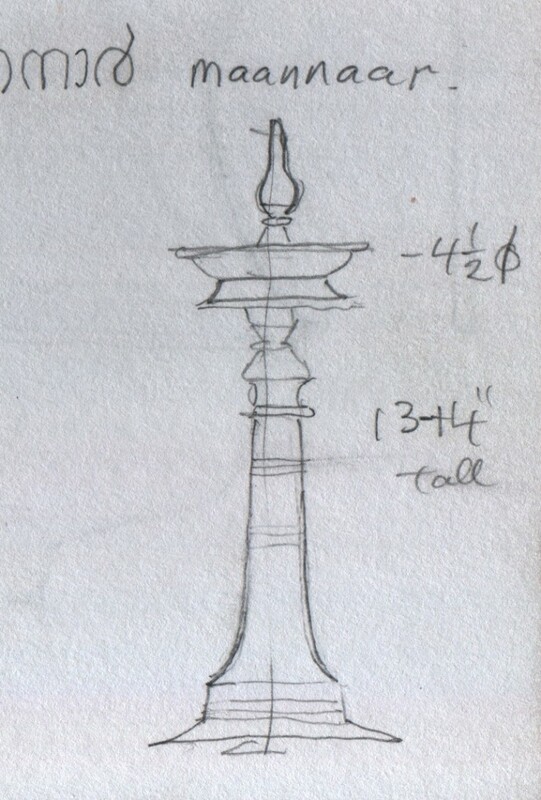 I thought that this old lamp had good proportions and crisp, well-chosen details. I was unable to find a modern lamp with such lines in the shops. Styles have changed. 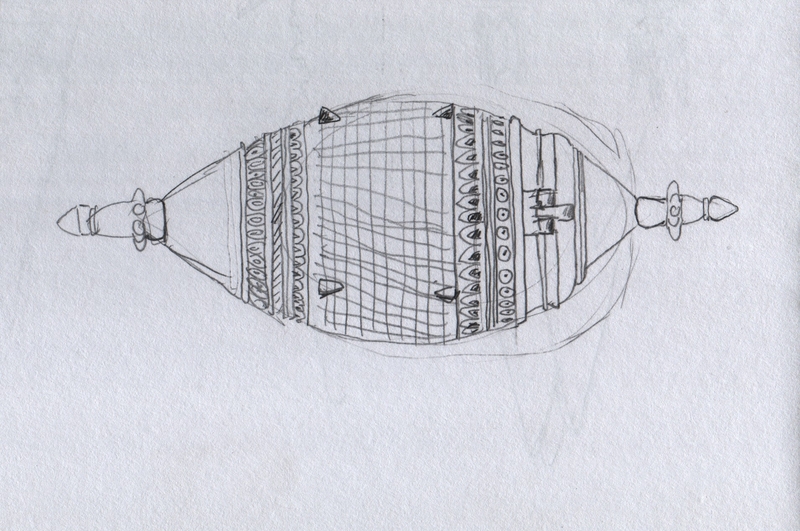 The Malayalam word for lamp is വിളക്ക് (vilakku). 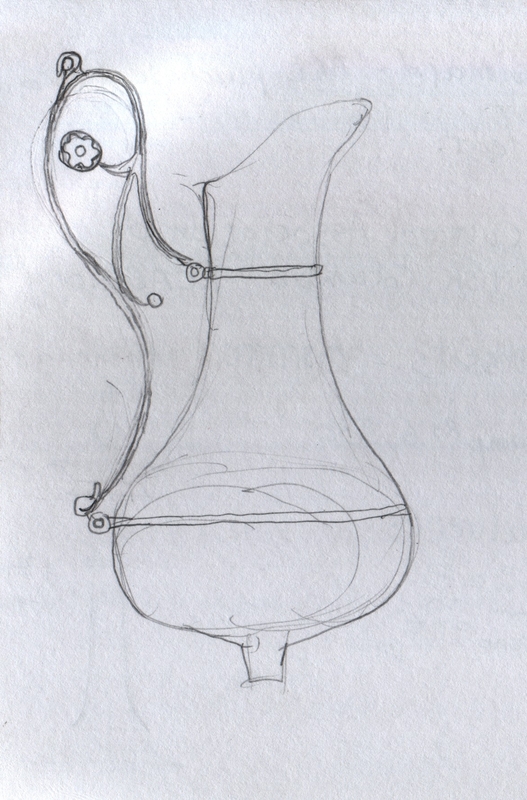 This tiny, delicate glass decanter, only a few inches tall, has a slender metal handle that is attached by two rings. The decanter might be missing its base. The privately held museum has a shop in which they sell surplus items. This decanter was among them. 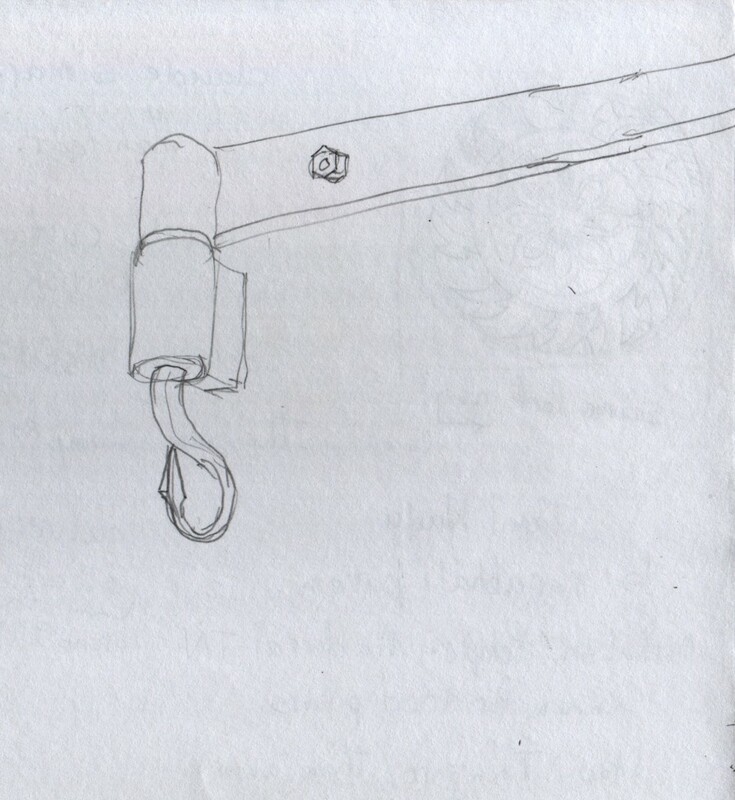 This forged steel hinge had a pin that was drawn out, forged into a dart shape, and curved into a loop. This bhasmathattu, or holy ash container, is more elaborately carved than the one on view in Hill Palace Museum’s ettukettu. This bhasmathattu also hangs from the ceiling. 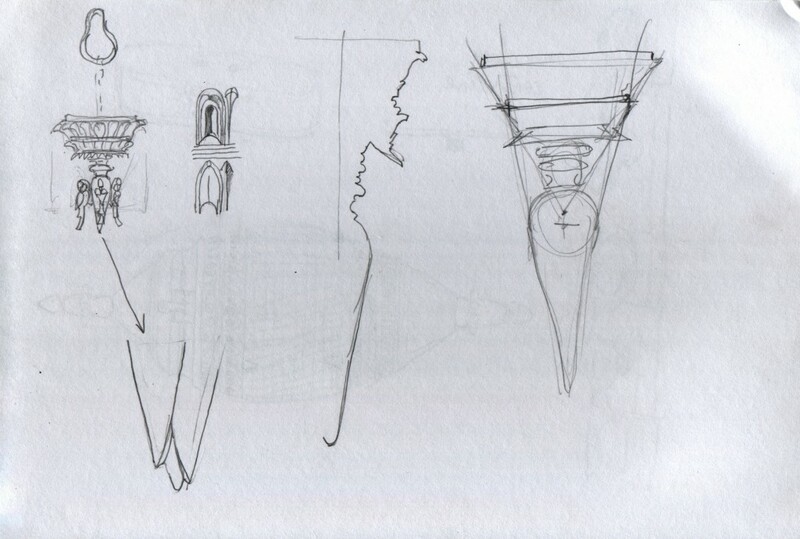 The cone-shaped finial at the bottom has four small carved birds perched around its circumference. The tip of the cone suggests a flower blossom on the verge of opening. The bowl at the top has rows of repeating, intricate leaf designs carved into its outside. On double doors, an ornamentally carved plank overlaps the gap where the doors meet. 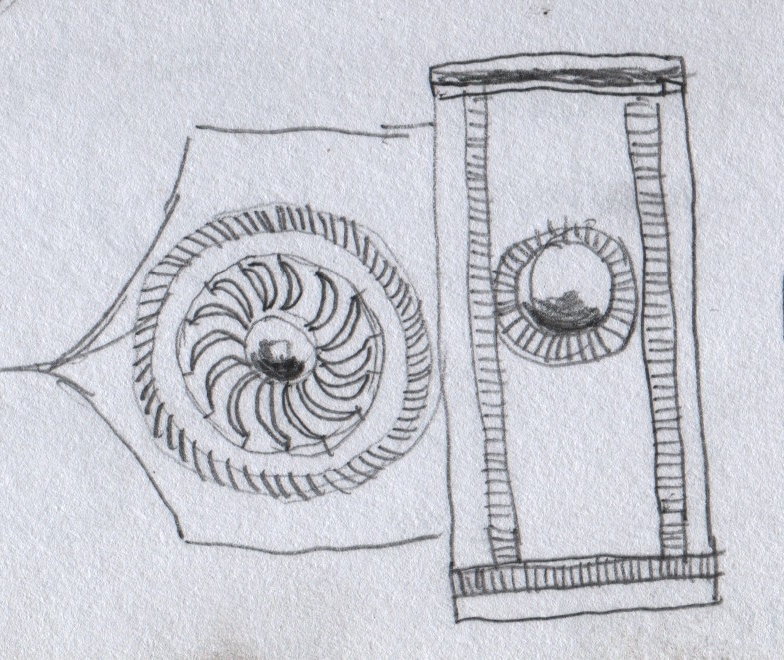 These motifs, alternating loops and domes, showed up on several doors that I saw. Kerala Folklore Theatre and Museum, Ernakulam. This small metal container was pierced over much of its surface, making a mesh pattern. 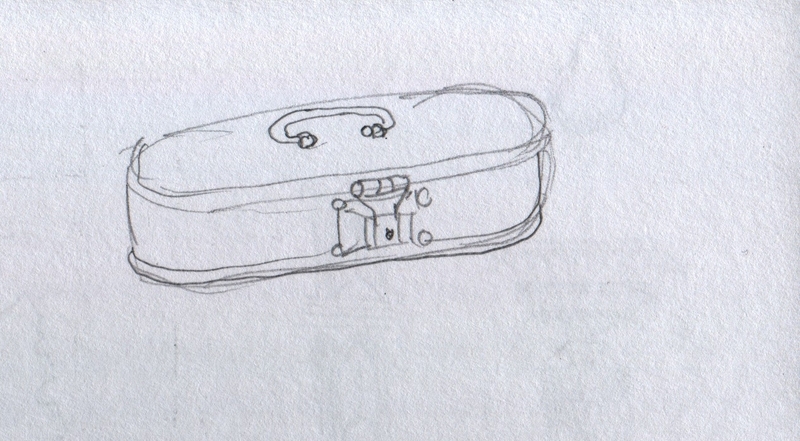 The label indicated that it is a container for ayurvedic medicine. Small metal box on exhibit at the Kerala Folklore Theatre and Museum, Thevara, Ernakulam.